New engine, sheetmetal, infotainment, and safety systems enhance the compact crossover. Just yesterday Mercedes revealed the new AMG GLE53 it will be showing for the first time next week in Geneva. But the mid-size performance model isn't the only new crossover it's rolling out. Hot on its heels (and further downmarket), the German automaker has revealed an updated version of the smaller GLC. Launched to keep the compact crossover at the top of its game, the facelift arrives four and a half years since the current/outgoing model hit the scene, and a little over a decade since the preceding GLK first entered the segment. The basic parameters and essential underpinnings are the same, but the revised GLC benefits from updated styling, a new engine, and the latest infotainment and driver-assistance technologies Daimler has to throw at it. The sheetmetal has been redesigned for a "wide and sporty visual appearance,” with "muscularly sculpted surfaces” and more chrome. LED headlamps come standard, and there are new wheel and color options to choose from. The interior has been spruced up as well, but the biggest change inside is the arrival of Benz's trick new MBUX infotainment system. Global customers will be able to choose between two gasoline engines and three diesels. But the GLC300 is the only one that'll reach US showrooms (until the AMG models arrive), with a new 2.0-liter turbo four (internally designated M264) to replace the old one (M274). Torque remains the same at 273 lb-ft, but power output rises from 242 hp to 255 hp, while reducing carbo emissions and fuel consumption. A nine-speed automatic still transmits the power to either the rear wheels or all four. And there are more driver-assistance features fitted as standard or as optional extras. The features are almost too long to list, but includes active distance, brake, lane-change, blind-spot, parking, and steering assist, as well as adaptive route-based speed adaptation. 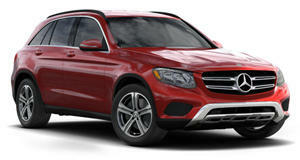 With all those enhancements, the updated GLC stands to secure its spot as the best-selling model in an increasingly competitive segment. It'll have to fend of the advances of such compatriot rivals as the BMW X3, Audi Q5, and Porsche Macan; Japanese challengers like the Lexus NX, Acura RDX, and Infiniti QX50; Americans like the Cadillac XT5 and Lincoln MKC; and other Europeans like the Volvo XC60, Alfa Romeo Stelvio, and various from Jaguar Land Rover. Pricing for the facelifted GLC has yet to be announced, but you can expect a small premium over the $40,700 Mercedes has charged for the current/outgoing model when the new one reaches US showrooms later this year. We can also anticipate similar revisions to be applied as well to the GLC Coupe, with hybrid and AMG performance versions to follow in short order. And you can bet the new engine will make its way to other models, too.